4 States in 8 Hours …. At This Rate…. After a 1-day layover in the Spring Break locale that threatens to overtake Fort Lauderdale — Mountain Home, Idaho — we hit Interstate 84 bright and early. I -84 between Mountain Home and Boise is a stretch of road that I convinced myself as a child would soon be replaced my bullet trains and other lightning fast and futuristic modes of travel. Instead, decades later, we drive the same old-fashioned kind of cars, just with worse gas mileage. But that didn’t erase the fact that we had a beautiful sunny day and everyone had gotten in the Pilot at the pre-assigned take-off time. When we got off 84 and started driving through Snake River Valley wine country, my mood soared, despite the fact that I knew an early Tuesday morning tasting an hour into our trip was most likely out of the question. By the time we hit eastern Oregon, the Pilot was filled with an incredible harmony, underlined by the fact that Iron Chef slipped in a Grateful Dead playlist. As Jerry Garcia advised “Bertha, don’t you come around here anymore,” Her Royal Highness and Odd Number appeared not to take notice. When the Dead broke into a long, “I forgot the lyrics” jam, nobody cried out in protest. As we crossed the Owyhee River, visions of Iron Chef’s pre-kid VW microbus with the paisley curtains came to mind. This is the little family I always thought we’d have — going down the road feelin’ bad. When we reached a sort of podunk mecca — Jordan Valley, Oregon — we stopped at the Rockhouse and bought Odd a chocolate milkshake despite the early hour. We were a road trip family now, adhering to no rules but our own (and the drastically slow Oregon speed limit). 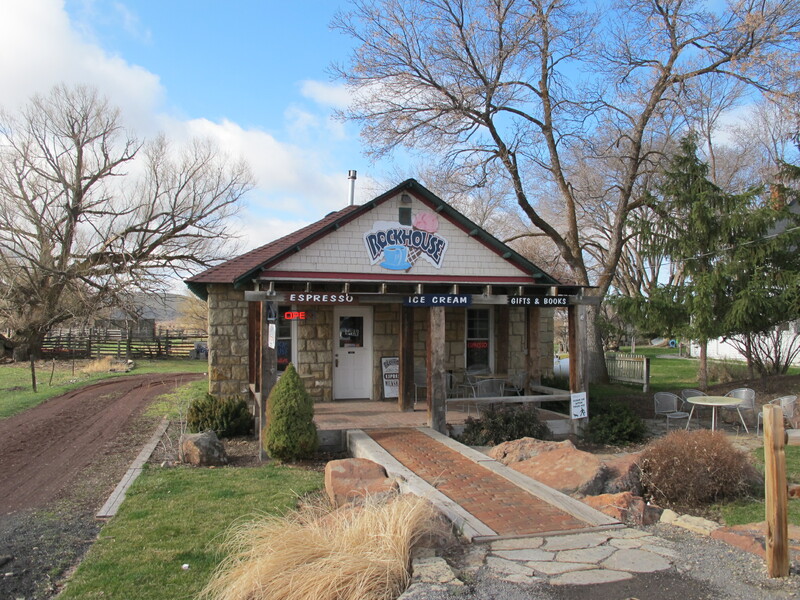 We ate lunch at Ormachea’s basque eatery in Winnemucca and marked Nevada off our list. “No, mom, she thought the monkey was a demon sloth!” Hmmm. Then, after 6 hours in the car, and 4.5 hours after the chocolate milkshake wore off, Odd queried, “Are we staying at a nice hotel tonight, or a Holiday Inn?” (As incredibly loyal Holiday Inn priority club members, Holiday staff rush to the door when we come in, rewarding us with a bottle of water and occasionally an extra room key). Thinking back on some of the MOTELS I’ve stayed in over the years, Holiday Inn ranks pretty damn high. 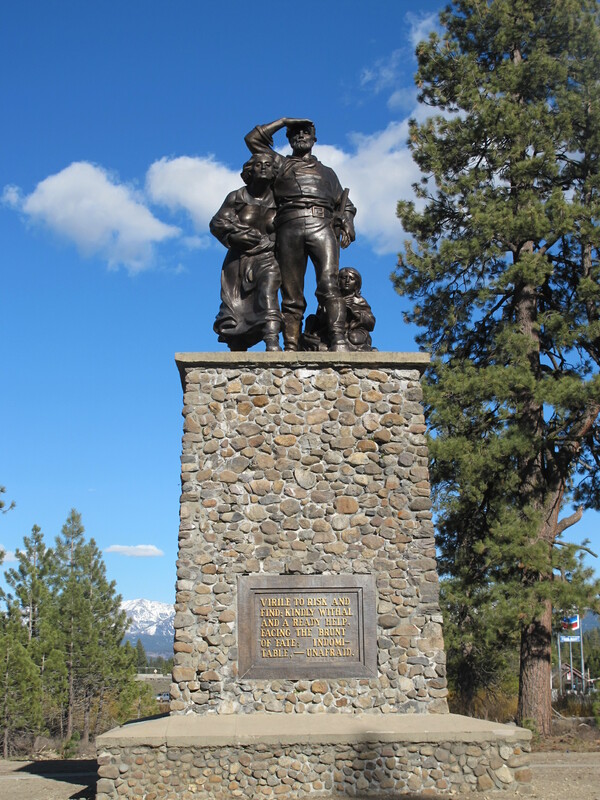 Interestingly enough, our hotel in Truckee, California, was located conveniently next to Donner State Park, in memory of the California Trail pioneers who ate their children when they complained about 3-star accommodations. Statue at Donner State Park. Families who survive road trips deserve to be bronzed. As a topper to the day, we dined at the FiftyFifty Brewery, perhaps the finest place on Earth to take your mind off 8 hours of forced family fun in a confined space. FiftyFifty deserves its own post, but for now, I’ll say that the Donner Party Porter kept our family together and on to Day 3 of our Insane Hockey Road Trip.